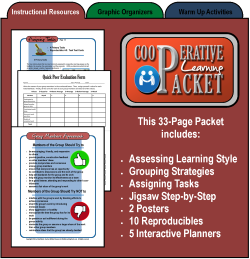 Whether you’re a veteran or a beginner, this cooperative learning packet is loaded with practical resources you can use straight out of the PDF’s! With these handy planning tools (one for each subject area), quickly plot out jigsaw activities for all of your classes. Then, copy and paste them into your lesson plans, save them for reference, or print them for your records. 5 Jigsaw Generators (one for each subject area), are inc1uded. Don’t teach 5 different subjects? No problem. Use the extra ones for additional interactive planning sheets! Free and Full Downloads are Available! Both of the following versions of this packet are PDF publications. As a result, they are completely compatible with both Windows and Mac. Thank you for your interest and time, and especially, thanks for all you do for our kids. I'm guessing that if you're anything like me at all, you are always on the lookout for ideas for teachers. My primary purpose for Daily Teaching Tools is to make it useful to you and supportive of your efforts. One of the most important things that I can do to realize that purpose is to gather ideas from you, my fellow teacher. What idea(s) about teaching could you share with us? A strategy or procedure, perhaps? Something that you have found to be effective with kids? It’s quick, easy, and painless—I promise. Just visit the Teaching Ideas page and see for yourself! If you’d like to spend more than just a few moments and go a little more in depth, guest posts are more than welcome—please see the details about contributing to the Guest Author’s Toolbox. The Bottom Line: We’re looking forward to learning from you, so that we can be more effective with OUR kids!